For those that do not otherwise have access to the Weekly Tax Bulletin, a further recent article is extracted below. 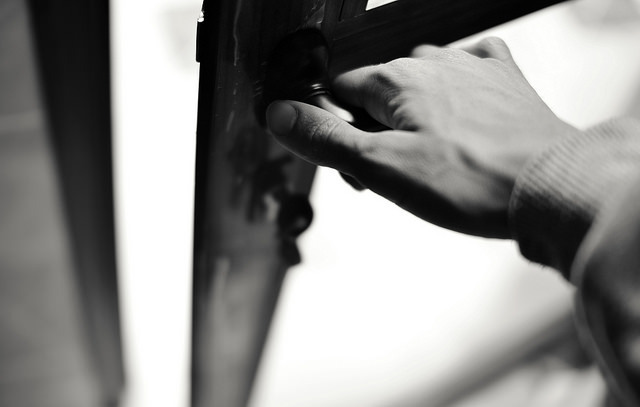 The recent Tax Office Private Binding Ruling Authorisation number 1012921290075 (Ruling), considers a number of key issues relating to the concept of trust splitting. no stamp duty relief (which is the case in most Australian states). The Ruling is a timely reminder of the need to ensure care is taken with any intended rearrangement of an existing trust. narrowing by deed amendment the class of beneficiaries of each split trust to focus around the family unit intended to control that trust will cause a resettlement. Arguably, since the decision in FCT v Clark  FCAFC 5 (Clark) and the ATO’s response in Tax Determination 2012/21, none of the above conclusions are controversial, other than in relation to the narrowing of beneficiaries causing a resettlement. It is important to note however that the ability to limit the right of indemnity does change the previously adopted ATO position. It might be recalled that in Clark, a majority of the Full Federal Court held that changes to a trust (primarily a change in the ownership of units of beneficial entitlement to the trust property and changes to the trust property itself) did not result in a break in continuity of the trust. As a result, capital losses incurred by the trustee before those changes occurred could be offset in calculating net capital gains arising after the changes occurred. Each of these issues are explored in more detail below. One of the fundamental concerns with trust splitting, as compared with trust cloning, was the asset protection issues with trust splitting, if the trustee of each split trust remained able to be indemnified from assets held by other trustees of assets in a different split trust. Prior to this Ruling, ATO guidance has historically indicated that limiting a trustee’s right of indemnity as part of a trust splitting arrangement could cause CGT event E1 to happen. In particular, in ATO Interpretative Decision 2009/86, it was decided that a trust split did trigger CGT event E1 on the basis that there was a 'fundamental change to the rights and obligations attaching to the trust assets’. A key aspect raised by the ATO was that the trustee's rights of the ‘original’ trust had been altered by excluding the transferred assets from its right of indemnity. In the Ruling, a desire to limit the right of indemnity was based on achieving the asset protection objectives and to align with the estate plans of the shareholders and directors of the trustee of the orignal trust. However the ATO confirms in the Ruling that, following Clark, this type of change does not result in the trust estate as originally constituted coming to an end. Furthermore the altering of the indemnity does not cause any of the assets of a trust to be subject to a new charter of rights or obligations separate to those on which the property was originally settled. Rather, the restriction of the respective trustee’s rights to be indemnified is in fact consistent with the appointment of separate trustees over different assets of a trust. Ultimately then the changes, without more, did not alter the rights of the beneficiaries to be able to benefit from all of the assets of the trust. Again due to the objectives under the estate plans of the shareholders and directors of the trustee of the orignal trust, there was a desire to narrow the class of potential beneficiaries. In the Ruling the ATO states that any such change will amount to a situation where assets are commenced to be held on trusts different to the original trust. In other words, that CGT event E1 would happen by reason of the changes. In reaching this conclusion the ATO relies heavily on the decision in Commissioner of State Revenue v. Lam & Kym Pty Ltd (2004) 58 ATR 60 (Lam & Kym). Lam & Kym involved an express declaration of trust over specific assets, which does not appear to be the case in the factual scenario considered in the Ruling. In any event, Lam & Kym was a Victorian Supreme Court case which has been largely superseded by the High Court in Clark. Clark confirmed, as acknowledged in TD 2012/21, that a variation of a trust by the trustee in accordance with an express power in the trust instrument will generally not result in the establishment of a new trust. The narrowing of a beneficiary class is analogous to Clark and TD 2012/21, which confirm that no resettlement arises from a variation of beneficiaries where the variation is permitted by the trust deed and there is continuity of the trust estate. The Ruling provides useful clarity around the scope of changes that can be implemented as part of a trust splitting arrangement. While the ATO’s position in relation to narrowing beneficiary classes is disappointing, there remains significant scope for helping trustees achieve succession planning objectives via trust splitting. A recent post listed the five main ways in which a will can be challenged – see - http://blog.viewlegal.com.au/2016/01/ways-to-contest-will.html. One of the aspects listed was the ability to challenge a will due to the will maker not making the document of their own free desire. 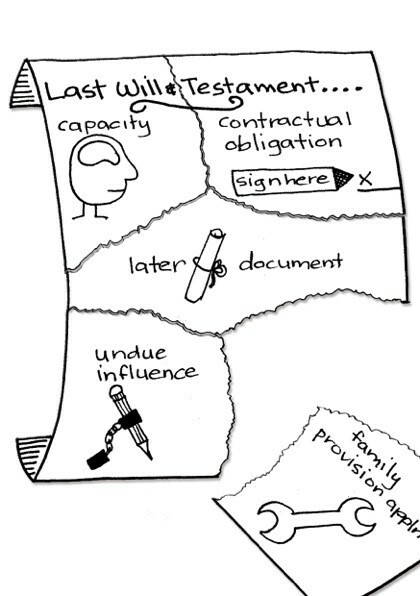 While there will always be a myriad of influences on someone when they decide to make their will, a will is only invalid if any such influence is determined to be 'undue'. 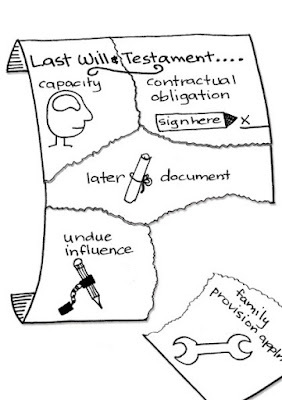 Undue influence is said to exist when there is something so strong that the will maker is under the belief that while the document is not what they want, they feel compelled to sign it anyway. A recent post http://blog.viewlegal.com.au/2016/03/joining-dots-innovators-dilemma-and.html touched on the combination of the 'ping' generation and the fact that time billing effectively rewards those who allow Parkinson's Law to rule unchecked. 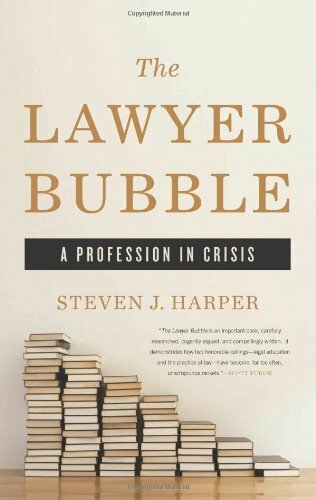 The book by Steven Harper 'The Lawyer Bubble' (see - http://www.amazon.com/The-Lawyer-Bubble-Profession-Crisis/dp/0465058779) details why the legal profession, and probably most other professions, will likely struggle to reinvent any of the core aspects of their business model, at least in relation to time billing, in the short term. engrained arrogance, particularly in relation to solutions that undermine the traditional personalised bespoke service offering (such as alternative business models, offshoring, outsourcing and automation). Harper argues that any change to the 'BigLaw' business model from within the profession will require that the university system starts to reward students who are able to demonstrate more innovative attributes than those outlined above. Just as importantly however, the owners of the incumbent firms must themselves create a demand for this style of graduate. 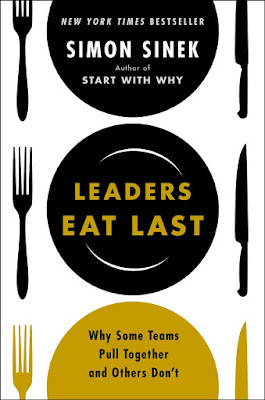 As Christensen predicts however in the Innovator's Dilemma, the prospect of the incumbent firms having the vision to truly cannibalise their existing business model is at best remote. As mentioned previously, we began the journey to address many of the above challenges over 10 years ago. For many, the journey has started more recently and we believe it important to share our learnings. Our upcoming roadshow (see - http://viewlegal.com.au/roadshow-interest/) is another example of this. If, for example, you've got your mum and dad as the shareholders in a trustee company, and as part of the trust splitting arrangement, you're wanting to actually transfer the shares in that company, because you're wanting to transfer the ultimate control, what the stamp duty offices may do is notionally deem the value of that company to be exactly equal to the value of the assets inside the trust. Effectively this creates a situation where, even though that’s invariably only a $2 company, for stamp duty purposes, the shares in the trustee company will be notionally deemed to be the same value as the family trust, and the shareholders will pay stamp duty on that value. There are exemptions to that outcome, but the starting point is that it is dutiable. If you're not aware of this risk and you've had clients enter into one of those transactions, you need to become very aware of it, because there's now data matching between the Australian Securities Commission and the revenue authorities in both WA and Queensland. Therefore if you do your share transfer and process it through ASIC and haven't lodged that with the Stamps Office, you'll likely get a letter from the Stamps Office saying ‘please explain’. Why would we think that we can do our work, check our phones, write a paragraph, send a text, write another paragraph, send another text, without the same damage to our ability to concentrate? Generation Y thinks that, because they have grown up with all these technologies, they are better at multitasking. I would venture to argue they are not better at multitasking. What they are better at is being distracted. Parkinson's Law further reinforces the dangerous ramifications of the 'ping' mentality - i.e. that completion of any task always expands to the available time, unless there is true and disciplined commitment to a narrower timeframe. Our experience, having worked entirely fixed price for over 10 years now and having completely abandoned timesheets in 2013 largely mirrors the point Sinek makes. Indeed, some of the most talented and outstanding lawyers when time billing often become unable to excel in any aspect of a fixed price model. Invariably, this leads to significant angst for the relevant lawyer, the surrounding team members and ultimately the clients. In many respects, the innovator's dilemma assumes that at least part of the disruption of any industry will be driven by younger entrants, who do not have the level of investment in the heritage business model. Another book in a similar space suggests this will not be the case at least for the legal industry, if not numerous other professions, currently wedded to the time billing model will be touched on in a future post. Our upcoming roadshow (see -http://viewlegal.com.au/roadshow-interest/) will explore a number of these issues.